This week, with the flu season well and truly upon us, it seemed the perfect time for The Past Present to examine the history of medical care, particularly the establishment of hospitals. When the First Fleet arrived in Australia, it brought with it the naval surgeon John White, who was to be the head of the medical services in the new colony. He and his medical assistants set up tents at Dawes Point, which became Australia’s first ‘hospital’. Not long after, the tents were replaced with a more permanent building, and in 1790 this was again replaced with a prefabricated wood and copper hospital building which was brought to Australia with the Second Fleet. The hospital building wasn’t the only thing which the Second Fleet brought though. There were so many sick convicts newly arrived in the colony that tents (some accounts say up to 100 of them) needed to be set up, in addition to the existing hospital, to look after them. As the colony extended beyond Sydney itself, hospitals were built in other areas of settlement, at Parramatta, Windsor and Liverpool. Sydney itself though was struggling to deal with epidemics and emergencies. In 1810, when Governor Macquarie arrived, he quickly recognised the urgent need for new hospitals. The question was, how to fund the desperately needed general hospital. Macquarie came upon an ingenious solution, given three colonists a short term monopoly on bringing spirits (including the all important rum) into the colony, in exchange for the three constructing a general hospital on Macquarie Street. The hospital, which was opened in 1816 was officially called the Sydney Infirmary and Dispensary (and in 1881 this changed to Sydney Hospital) but it was popularly known in the colony as The Rum Hospital. Yet the foundations were substandard and the walls themselves were built from rubble which made an ideal home for pests like rats and bedbugs. The hospital was also too big for the Sydney population, and eventually some wings were transferred for other uses. 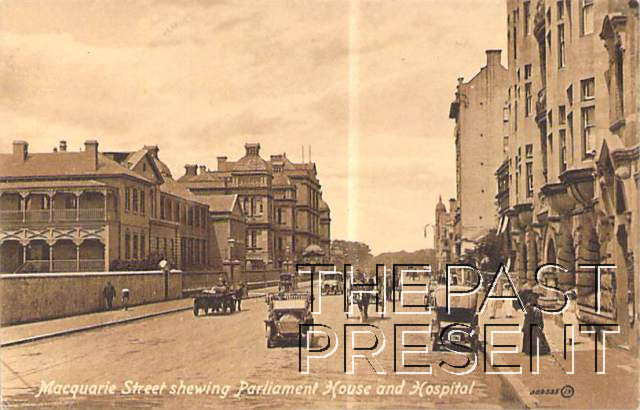 Today, the Northern Wing of the original hospital houses NSW Parliament while the Southern Wing is The Mint. This entry was posted in New South Wales, Sydney and tagged 1900s, buildings, government, streets, sydney.